The BRICS members are known for their significant influence on regional affairs. Since 2009, the BRICS nations have met annually at formal summits. China hosted the 9th BRICS summit in Xiamen on September 2017, while South Africa will do so for the 10th BRICS summit in July 2018. 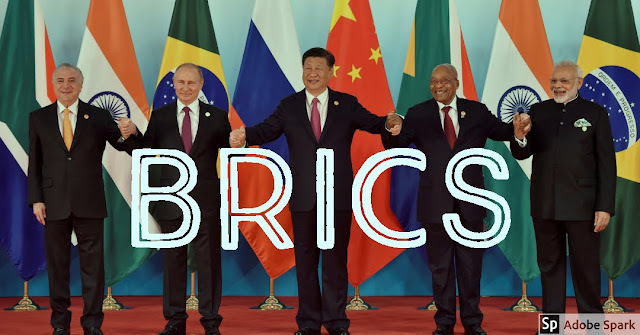 In this article we will discuss what exactly BRICS is and why it is so important. BRICS is a short form for the association of 5 major emerging economies - Brazil, Russia, India, China and South Africa. BRICS countries together account for 26.46% of world land area. These 5 BRICS nations represent more than 42% of the world's population. In September 2006, the foreign ministers of the initial BRIC states(Brazil, Russia, India and China) met in New York city at the margins of the General Debate of the UN General Assembly. On 16th June 2009, the first formal summit took place at Yekaterinburg, Russia and was attended by the heads of the BRIC states. South Africa officially became a member nation on 24 December 2010, after being formally invited by the BRIC countries to join the group. From the onwards, the association came to be known as BRICS. Afghanistan, Argentina, Lebanon, Indonesia, Mexico and Turkey have expressed strong interest in full membership of the BRICS. Egypt, Iran, Nigeria, Sudan, Syria and most recently Bangladesh and Greece have also expressed interest in joining BRICS. As of 2018, these five nations have a combined nominal GDP of US$18.6 trillion (23.2% of the gross world product), combined GDP (PPP) of around US$40.55 trillion (32% of World's GDP PPP) and an estimated US$4.46 trillion in combined foreign reserves. The BRICS nations have 13.24% of World Bank voting power and 14.91% of IMF quota shares. They have also contributed more than 50% of world economic growth during the last 10 years. Main objectives of BRICS is to cooperate between the member nations for development, provide financial assistance, support various projects, infrastructure etc. BRICS has also agreed to provide financial assistance, support to countries other than members. It is a multilateral development bank operated by the BRICS states. It comes under the category of International Financial Institution. It was formerly known as BRICS development bank. Kundapur Vaman Kamath, former chairman of Infosys is the current President of the NDB. Its Headquarters are located in Shanghai, China. The BRICS Contingent Reserve Arrangement (CRA) is a framework for providing protection against global liquidity pressures like currency issues where members' national currencies are being adversely affected by global financial pressures. It was established in 2015 by the BRICS countries. It is generally seen as a competitor to the IMF and along with the NDB, it is viewed as an example of increasing South-South cooperation.